After a fulfilling breakfast we spend the first part of Labor Day laboring up a long hill. The sun is out, it seems that weather-wise it is going to be the best day yet and after a rest day we are excited to see more new scenery. 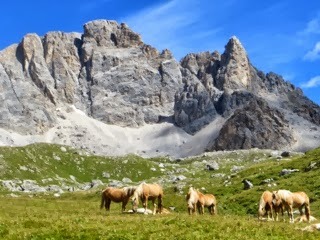 The scenery, as we leave town, is one of a mixed forest through which a paved road leads us. Eventually we loose the pavement and proceed on gravel road to an intersection. 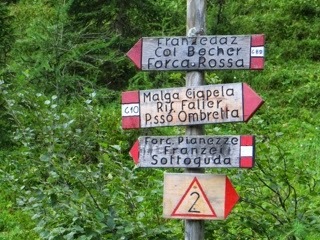 Sign for Forca Rossa where we are heading suggests to go left, but Alta Via 2 sign clearly points to the right. According to a map we should be making a left turn somewhere in this area but keep on gaining elevation. The left turn at this junction heads downhill. 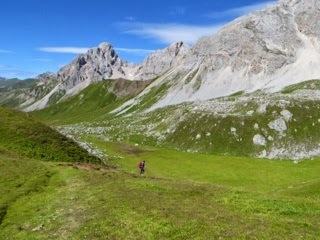 We decide to follow the AV2 route and find our left turn a switchback higher. 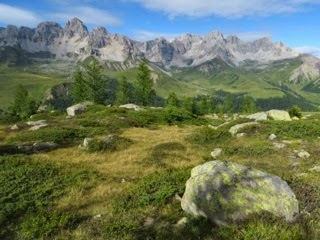 Larches dominate along the trail now, scattered thinly on the grassy slopes, with a backdrop of rugged mountains. We are too early for fall colors, but my imaginations runs wild picturing the trees dressed in their yellow coat. On a smaller scale, flowers bloom along the trail, some of them familiar from the previous several days, some I don’t believe we had an opportunity to see yet. 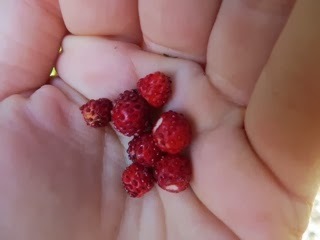 We also find a first patch of wild strawberries, and yet another one, yielding small but delicious snack. Fresh wild strawberries – yum! 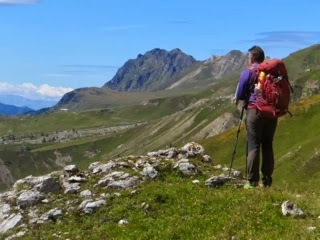 Eventually we leave the larches behind and walk through open grassland being able to fully appreciate the majestic peaks around us. 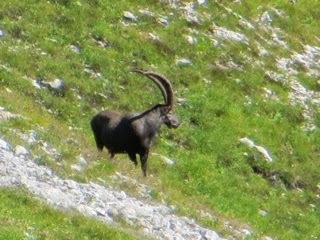 Ibex down below us watches our steps, too far for a naked eye but thanks to a high zoom camera we get a decent view. 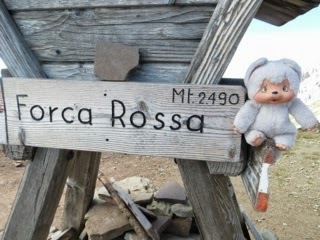 Reaching Forca Rossa, elevation 2,490 m, at 11:30 a.m., the uphill is over, for the moment. We sign the geocaché register which we find at the pass, have a quick bite, and start the downhill stroll. 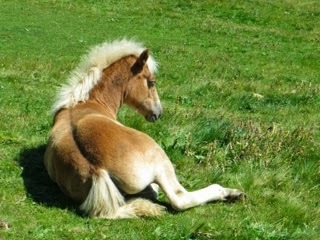 It is by far the most serene part of the trip, there is not a soul around us, except for horses roaming the pastures. 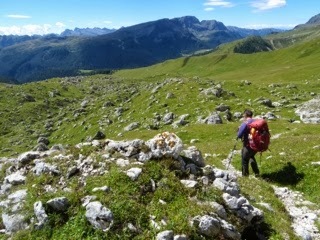 The trail is soft mix of grass and dirt and we make a good progress. 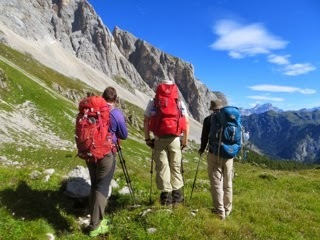 When a hoard of day hikers appears on horizon, it’s a sign we must be nearing civilization. 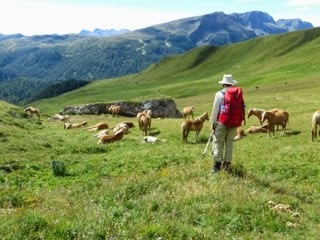 At 13:00 we enter a village of Fuchiade, home to a Refugio and several small wooden houses. From here for the next 3 kilometers the soft grass is replaced by paved road, smooth and gently graded but hard on the feet. 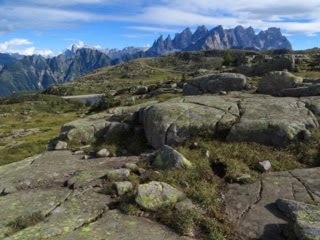 Passo St. Pellegrino, elevation 1,907 m, is the low point for the day. Replenishing our energy with spaghetti with ragú sauce and ice cream at Malga St. Pellegrino restaurant, we are ready to conquer the next uphill. 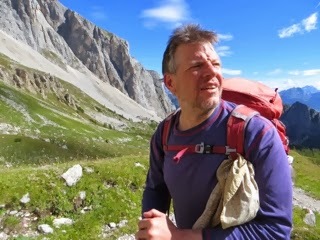 It’s about 1,000 feet of elevation we have to gain towards Forcella di Padazzo, elevation 2,220 meters. The trail, leading through slopes covered with blueberry bushes, is easy to follow thanks to good markings, and even though we have to make few easy moves to pull ourselves over boulders, it’s generally quite easy going. 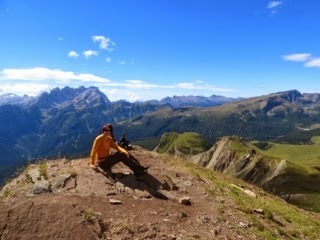 The views from up include distant mountains, closer up there is a lake and a ski lift. 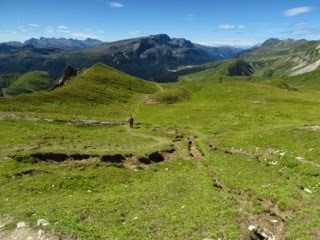 Once we top, we find a dirt road, wide and hard to miss, heading downhill towards our destination, Passo Valles. 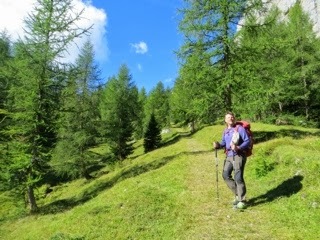 Luckily there is a side trail which not only cuts some distance but is more scenic, and after a long day of hiking, the cushy grass underfoot is much appreciated. 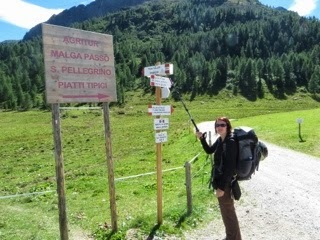 Passo Vales at 2,032 m welcomes us at 17:35. 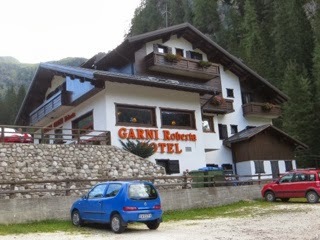 The Refugio here, unlike all the others we used so far, is privately own, and is more hotel like with private rooms and showers. The food is delicious after a long day on feet, and we even decide for desert, a specialty called Torrencino Semifreddo, a lemony tasting ice cream cake.